Ground breaking ZVT (Zero Voltage Transmission) uses constant, high power opposite polarity fields. 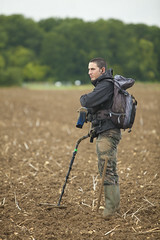 This greatly increases sensitivity and allows the Minelab GPZ 7000 to locate gold far deeper than other detectors. Few detectors are able to cope with mineralised ground, which is precisely the type of terrain that most gold is buried. The GPZ 7000 accurately ‘balances’ and automatically ‘tracks’ in the most severe ground conditions, with ease. Say goodbye to atmospheric interference and hello to smooth and quiet gold detecting. With 256 Noise Cancel channels, the GPZ 7000 brings the pleasure back into listening out for that promising sound. The Super-D smart coil also greatly decreases interference from magnetic soils thus reducing ground noise. The GPZ 7000 is easy to navigate, thanks to its simple menu system and accessible settings. The Guide Sequences are ideal for people who are new to gold hunting, making it a machine for everyone. No more wires and cables, and no more audio time lags. The WM 12 Wireless Module lets users detect without needing to attach their headphones to the machine. The Wi-Stream optimises sound quality. Choose between the built-in speaker, your favourite headphones, or the ones supplied. Imagine being able to see your location and log your finds as you go. A built-in GPS means you can cover more ground without missing a nugget, and you can save your favourite hotspots to XChange2 with Google Maps. The GPZ coil is waterproof and submersible to a depth of 1m (3ft), making rivers and shorelines a breeze – not to mention the unpredictable weather. Whether you’re a seasoned gold hunter or new to the game, the Minelab GPZ 7000 is guaranteed to be the perfect tool for the job.